My visit to Stokoe Farms was sponsored by the Christmas Tree Promotion Board and their “It’s Christmas, Keep It Real.” campaign but all opinions and recipes, including my rendition of the Stokoe Farms 2 Minute Pull Apart Caramel Apples- remain, as always, my own! I have a deep and abiding, life-long love of the magic of the Christmas season. From my earliest memories, the comfort, family-togetherness, and general good-will kept Christmas the centerpiece of my favourite time of year. 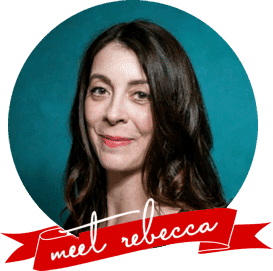 Starting around Thanksgiving when we went as a family to pick out our Christmas tree, I felt like the whole world was enveloped and steeped in a warm golden glow that kept the winter cold at bay all the way through the new year. My parents felt strongly that our Christmas tree should be real. I remember getting bundled up and going out to choose a tree that would fill up the corner of our little house we had designated as Christmas Central. The tree was usually the biggest one we thought we could reasonably fit and my dad took tremendous care to adjust it so that it was just right and sturdy in its stand. The smell of fresh pine filled our house and filled out the full sensory experience that I associate with Christmas. That said, when the Christmas Tree Promotion Board invited me to visit a renowned local Christmas Tree Farm – Stokoe Farms- it should come as no surprise that I jumped at it with both feet and brought one of my sons along with me. It was the end of September on a hot day and I got to Stokoe Farms – while they were kicking off their harvest time festivities. 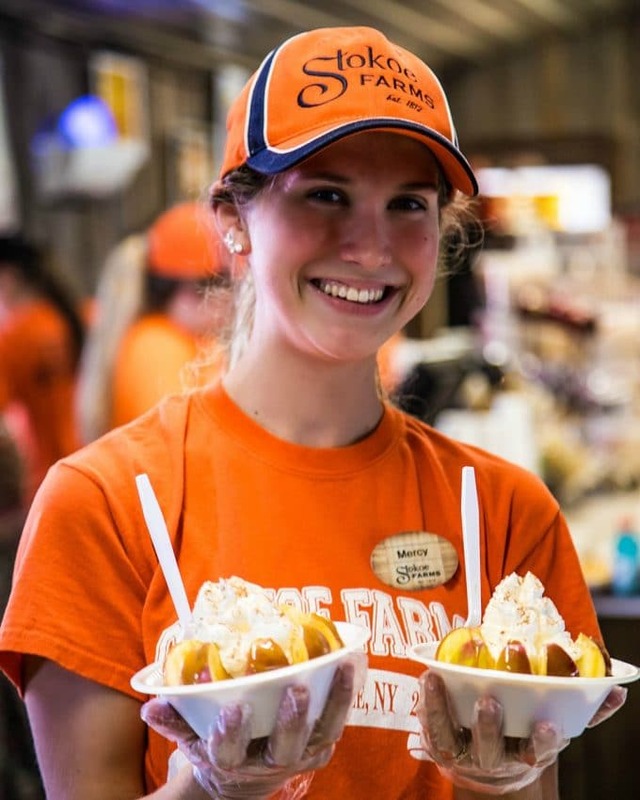 They had a corn maze, a Susan B. Anthony reenactor, and a couple hundred adults and kids milling around enjoying the gift shop, pumpkin displays, petting zoo, and concessions stands that Stokoe Farms offers. Speaking of the concessions stands, their big seller (in addition to the brand new line of house-made fudges) was a 2-Minute Pull Apart Caramel Apple; a fresh, crisp fall apple in easy to pull apart sections enrobed in a warm caramel and smothered in fresh whipped cream with a dusting of cinnamon. Aidan and I were beside ourselves with happiness and decided we need to recreate them when we got home. I had the privilege of meeting three generations of Stokoes that day; patriarch, daughter, and grandson. Each of them was tremendously passionate about the fact that they work all year long to make Christmas as magical as I remember it. And folks- the work that goes into each and every Christmas tree! It takes an average of 9 years to bring one single tree to market maturity and at Stokoe Farms, every single one of those tree is planted by hand; usually by Suzanne Stokoe’s hand herself. 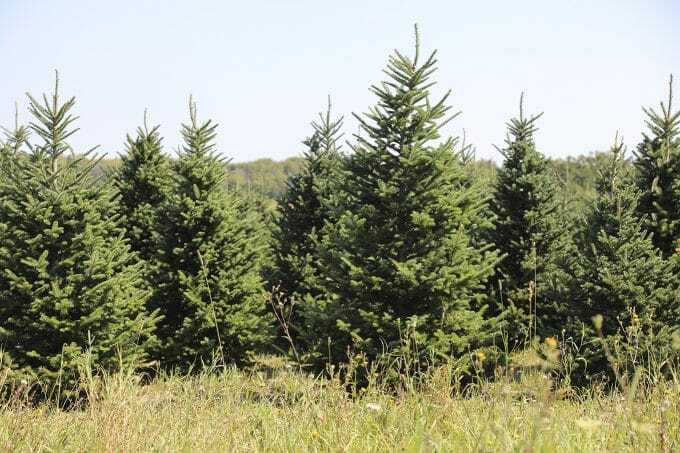 Buying real Christmas trees provides business for farmers. I’m talking about farmers like Suzanne Stokoe who takes the time to plant each of those Real Christmas Trees which are a real crop, farmer-planted and hand-harvested specifically for people to enjoy. And did you know that 100% of real Christmas trees sold in the U.S. are grown in North America (naturally)? 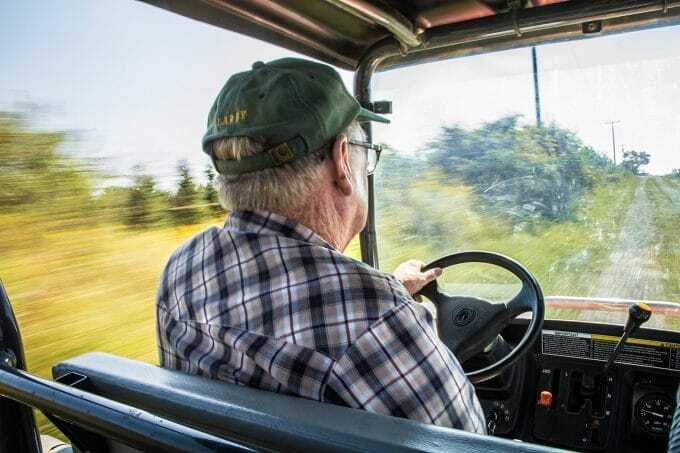 Her father, Larry Scott, was kind enough to drive my son, Aidan, and me for a tour around the farm which was still except for the buzzing of the bees. Larry took us through the history of the family’s working the land and showed a quiet pride in the care his family continues to take in cultivating beautiful trees and taking care of the land. Back at the farm, Suzanne and her son (who is spearheading a culinary renaissance and farm-to-table project for Stokoe Farms) gave me a little information that -had I not already been in the “It’s Christmas, Keep It Real.” camp- would have put me there firmly. Did you know that a real Christmas tree is good for the environment? It’s not just that they’re sustainable, farmers like the Stokoes grow Christmas trees especially for the holidays and it takes between 8 to 12 years to grow an average sized Christmas tree. During its growth, the tree is taking in carbon dioxide and releasing oxygen, helping to clean our air, provide a habitat for wild creatures, and condition the soil. After Christmas, most cities have a recycling program to pick up your holiday tree and grind it into mulch to help our soil even more. Our whole family cannot wait to head back to Stokoe Farms to pick out our Christmas tree this year and have more 2 Minute Pull Apart Caramel Apples. Searching for and selecting a real Christmas tree makes memories for families and friends that simply can’t be manufactured with a fake tree. You can’t replace the real, memorable scent of a tree with an artificial spray or tree. It just isn’t the same. Don’t overthink the apple choice, but pick one that is crisp, juicy, and as fresh as possible. We like tart Crispin apples for 2 Minute Pull Apart Caramel Apples, but choose your favourite. 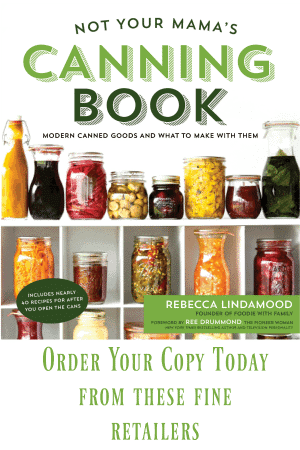 As for caramel, homemade is always going to be best, but don’t let it stop you if you’re not caramel-savvy. 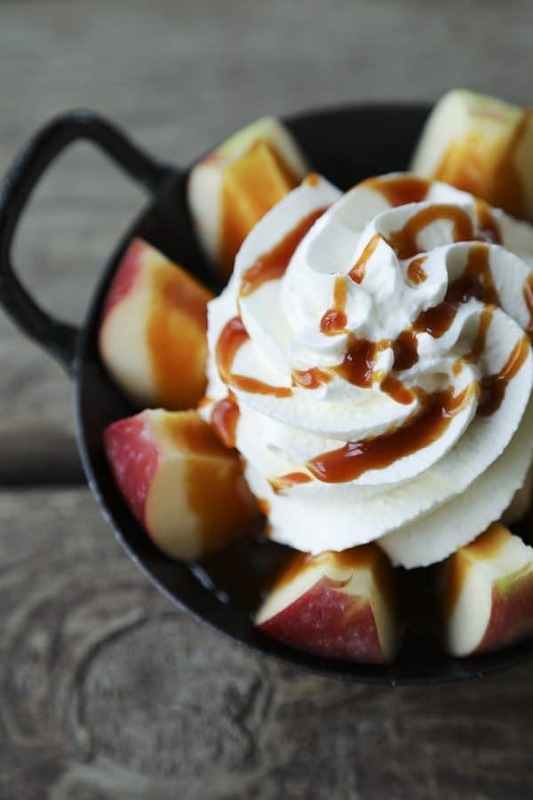 You can substitute a good quality store bought caramel sauce in 2 Minute Pull Apart Caramel Apples. When it comes to whipped cream, I’m a bit of a purist. 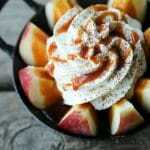 I prefer unsweetened whipped cream, particularly in this case with the fresh apple and sweet caramel sauce providing ample sweetness. If your tastes run to the sweeter, though, feel free to use a lightly sweetened commercial whipped cream. A little cinnamon goes a long way here, so choose a good one if you can. Dusting it through a sifter is your best bet. Use a corer/section maker to remove the core of one of the apples and divide it into sections. Arrange the sections in a bowl like a flower. 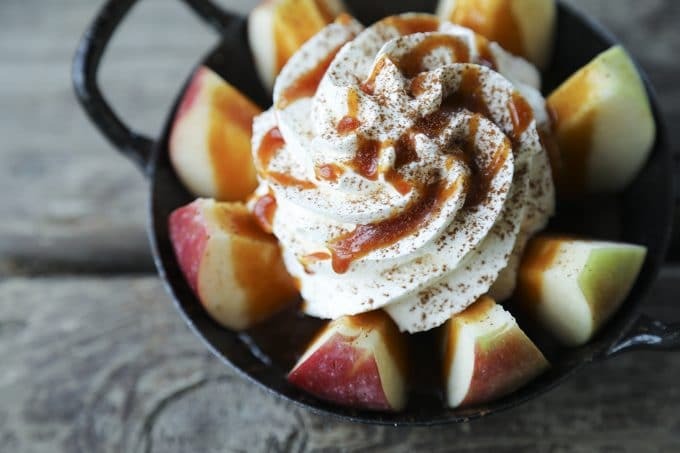 Drizzle half of the caramel sauce over the apple, top with a generous cap of whipped cream and a light dusting of cinnamon. Serve immediately and eat with your hands! 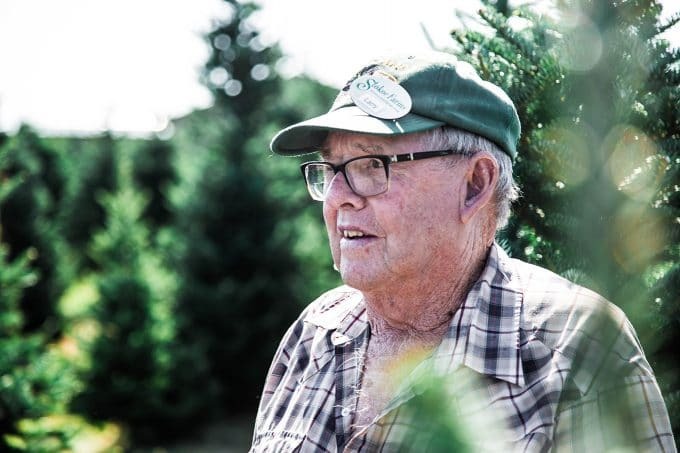 Here’s your chance to have a (virtual) visit to a Christmas Tree Farm and learn some more about REAL Christmas Tree farmers. Video courtesy of Two Talking Heads Video Productions. So simple, so beautiful to look at! Must buy myself one of those core things! !